Sencha - An Enigma of Japanese Green Tea? A comprehensive guide to the different types of sencha tea available. Despite being the most frequently drunk and well-known of Japanese tea, this green tea is an enigma. New to Japanese tea, I found it hard to pin down what exactly constitutes a sencha. The word literally means making a decoction of tea (as opposed to making a tea infusion). It is a not associated with any single tea plant, any process, or any place of production. Yet it is everything - this tea makes up over 80% of production of Japanese tea. Its method forms the core of Japanese tea processing. 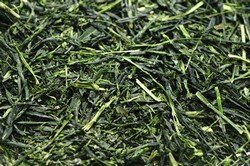 Any tea that has been gently steamed and rolled to produce a rich emerald tea is called a sencha. But first, we shall go over one fundamental feature of green tea processing: fixation or the initial firing. Green tea is unoxidised. And yet, freshly harvested tea leaves contain enzymes which encourage oxidation. The most important part of tea processing is how these tea enzymes are destroyed, so as to put a halt to oxidation. This process - called fixation - is what makes Japanese tea different. Fixation takes place via heating. There are three methods: steaming, pan-roasting and ovening. The Chinese use pan-roasting and ovening. They invented steaming, but gradually used less of it. It is the Japanese who persisted and perfected the art of steaming. All sencha teas are steamed, but the length of steaming can vary from 20 to 160 seconds. A regular sencha tea is moderately steamed for 30 to 40 seconds, while deep-steaming can last 40 to 60 seconds. A Fukamushi sencha tea is a deep-steamed green tea. The word Fukamushi means "steamed for a long time". Taste becomes stronger, less astringent and less grassy. Liquor color turns from emerald to a darker green. Leaves become more powdery. Poor control of steaming can turn tea cloudy. Besides regular and deep-steamed sencha, there exists also an aged or mature tea called Kuradashi. Spring harvests are stored to be sold from October to December. The storing process has been found to make the tea richer and milder. Finally, a Karigane is composed from stems collected from sencha tea leaves. This tea usually offers good value for money, as the price is reasonable and the stems can be brewed to yield a sweet and mellow taste. Just as different varieties of grapes are grown to make wine, different varieties of tea bush are grown to produce tea with different characteristics. The major breeds are the Chinese plant and Assamica. Among the four, Yabukita is most widely used, accounting for 80% of Japanese tea production. It was found in Shizuoka in 1908 by a planter named Suzuki. He happened to find this new tea breed north of a bamboo bush. In Japanese, "bush" is "Yabu" and "north" is "kita", consequently the named "Yabukita". Yabukita has been popular because it has very good flavor and is resistant to diseases. When the tea is harvested is very important. During the winter, tea bushes store up nutrients. When spring arrives, the newly sprouted tea buds are tender, lush green and packed with nutrients. They are the tastiest and make the highest grade. According to Japanese calendar, the first day of spring falls on 4 February, and the 88th day marks the first day of the plucking of tea leaves. According to Japanese tradition, those who drink the tea harvested on the first day will enjoy good health for the rest of the year. The first harvest is known as Shincha. Sometimes it is also called Ichibancha. Tea from the final harvest at the end of September is called yobancha. Where Are the Tea Buds? 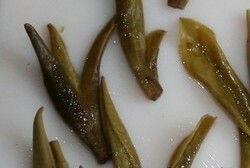 Most Shincha leaves are fairly matured and broken. There are virtually no tea buds. When grading green tea, timing is just one factor. The other factor being the type of leaves being harvested. Most Japanese green teas sold in the West have been machine harvested using the top 3-4 leaves, rather than the tippy one-bud-and-two-leaves customary in Chinese green tea. Hand harvested high grade Japanese green tea is truly rare. It is hard to compare Chinese and Japanese green tea - you will have to adjust your expectations. According to Ito, the three main growing regions are Shizuoka. Kagoshima and Mie. Shizuoka, located in the area between Mt. 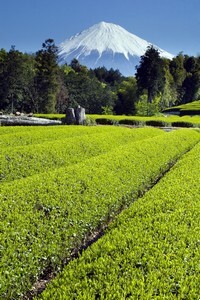 Fuji and the Pacific coast west of Tokyo, is Japan's most prolific tea-growing region, accounting for over 40% of Japan's commercial production each year. Next is Kagoshima, in southern Kyushu in the far southwest of Japan's main archipelago, which produces about 20% of Japan's tea. Other important tea-growing regions include the areas of the ancient capitals—Nara and Kyoto—where Japanese Buddhism has its roots, and various parts of Kyushu, with its comparatively mild climes. Learn how to brew hot or iced.